Gov. Jerry Brown’s proposed re-engineering of the California public school finance system takes a chapter out of President Obama’s urban policy playbook to covertly fund big city school districts with suburban money. We could see more of that tonight in the president’s State of the Union address. When politically Blue coastal suburban California counties voted for Brown’s Proposition 30 tax increase last November, they were told the ultra-rich would pay to plug deficits in public school funding. But it turned out Brown wants to take public school taxes away from those districts. Instead of getting more money, the suburban districts could get less. Then Brown, if his proposed budget is enacted, would transfer those funds to large city school districts with impoverished students. On top of that, Brown’s school financing reforms intentionally would underfund suburban school districts, meaning they would have to pass local parcel taxes if they want adequate school funding. The suburban middle class mostly would have to pay more local school taxes after they thought they were voting to shift added school taxes onto the very rich. But Prop. 30 didn’t disclose any of these reforms. Where does it say this redistribution of school taxes is authorized? In other words, if suburban school districts want schoolbooks or smaller high school class sizes, they are going to have to raise local taxes to pay for them. 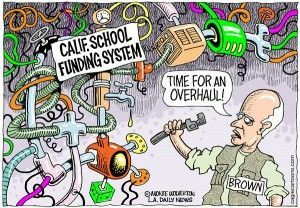 Brown’s school financing reforms go beyond those attempted through the courts in the infamous Serrano vs. Priest court cases in 1971 and 1976 that mandated “equity” in local school funding. These court reforms were eventually constrained by Proposition 13 in 1978, which forced a shift from local school funding to the mostly statewide financing of public schools. Brown’s reforms would go beyond court-mandated “equitable” school funding to the redistribution of money from suburbs to big-city school districts by underfunding suburban school districts. The particular policy for doing this is something called a “Concentration Grant” contained in Brown’s new school-funding formula. According Kurtz, a senior fellow at the Ethics and Public Policy Center in Washington, D.C., the goal of such policies promoted by Obama and now implemented by Brown is effectively to dissolve the barriers between the cities and the suburbs. California state government would become one giant wealth redistribution machine. Kurtz explains that Obama’s policies are meant to reverse the income and real estate wealth disparities. There basically has been no public debate in California about the implementation of these redistribution policies. For the most part the policies are being implemented without explicit public disclosure and discussion by burying the details in hard to understand budget trailer bills. The only voter initiative or legislation that explicitly attempted to regionalize school and public service financing, Proposition 31 last November, failed at the ballot box with 60.5 percent voter opposition by both conservatives and liberal voters. Undeterred by the voters, Brown would covertly regionalize school financing in his 2013-14 budget proposal. And he has used the 55 percent voter approval for his Prop. 30 tax hike as a purported public endorsement for such school financing reforms. But nobody explicitly endorsed or voted for such radical school-financing reforms as part of his tax hike. It’s just something Brown put into his budget proposal. We will see if the voters will sustain these reforms in the long run once they become aware of their implications.